This page covers advantages and disadvantages of Data Fusion. It mentions Data Fusion advantages or benefits and Data Fusion disadvantages or drawbacks. The process of integrating multiple data from sensors or sources in order to produce more consistent and accurate information is known as data fusion. The multiple data sources provide better results compare to individual data source. Based on processing stages used in the process, data fusion can be categorized into low, medium and high. Data fusion involves fusion of various types and forms of data in order to enhance data quality and decision making. In other words, it is defined as "theory, tools and techniques used for combining multiple sensory data into a common representational format. Due to advancement in IoT (Internet of Things), huge amount of data (i.e. big data) are generated. This necessitates use of data fusion. 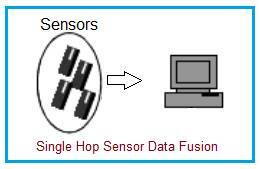 The figure-1 depicts single hop sensor data fusion system. In this system, every sensor transmits data to the data fusion center directly. The figure-2 depicts multi hop sensor data fusion system. It combines information from multiple sensor sources. 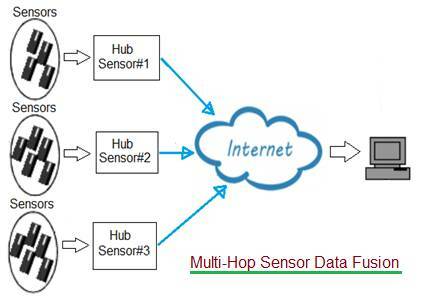 In this system, multiple sensors data are collected by hub sensor or aggregator which is connected with data fusion system either directly or via internet cloud. Data fusion mathematical models are probability based, AI (Artificial Intelligence) based or theory of evidence based. There are various data fusion stages which include decision level, pixel level, feature level and signal level. • Data fusion at decision level is ensemble of decisions. • In pixel based data fusion, fusion of information takes place at imaging device level. • In feature based data fusion, fusion of information takes place prior to decision making. • In signal based data fusion, fusion of information takes place at the sensor node or within local network. ➨Multiple sensor based data fusion makes information more decisive, intelligent, sensible and precise than single sensor based data fusion. ➨Data fusion helps in statistical analysis of "N" independent observations. ➨As data fusion helps in creation of highly accurate information, low power sensors with little low accuracy can also be employed in IoT based networks rather than high accuracy power hungry sensors. ➨It helps in handling issues faced related to big data generated by IoT based systems. ➨It helps in hiding critical information. Following are the drawbacks or disadvantages of Data Fusion. These challenges are required to be addressed in order to have successful data fusion system. ➨IoT network consisting of several hundreds and thousands of sensors generate trivial and nontrivial data. Processing of trivial data may affect accuracy of data fusion algorithms. Hence most relevant features and most importance data are sorted for data fusion algorithms. ➨Data fusion is not static process in nature. ➨Conflicting nature of data provide counter-intuitive results. Hence data fusion algorithms must take atmost care while handling conflicting data. ➨Data correlation and alignment should be handled before data fusion process. This is more common in WSNs (Wireless Sensor Networks). ➨Data imperfection and data inconsistencies must be dealt with effectively while using data fusion algorithms. Also refer advantages and disadvantages of Data Analytics >>.